Once again I find myself doing this on the last possible day. Luckily we are having dinner at some friends' house tonight so I won't have to eat it all by myself. Naturally today had to be one of the hottest days we had in more than a month, so it will be a challenge to take a picture of the ice cream before it melts. But I won't be a daring baker if I didn't try in the worst possible conditions. To read the whole recipe click here, I will tell you about my version. To be true to the challenge we had to make two things from the original recipe, the short tart dough and the frangipane. We could be daring, however, and change the rest of the elements. Some of the comments that had been posted in the daring kitchen private forum made me decide to decrease the amount of sugar in the frangipane as some people found the tart overwhelmingly sweet. The frangipane recipe given is very different from the one I normally make, which calls for less sugar and just one egg for the same amount of butter so I was curious to try it. I only used 80 gr. 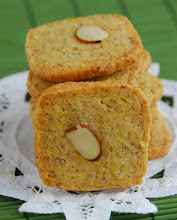 of powder sugar instead of 125, and added extra ground almonds to compensate for the super liquid frangipane. I decided to make mini tarts so they would bake faster and will look more elegant in individual plates. For the jam, I initially thought of using the blood orange jam I made few months ago, but then I saw some beautiful figs at the market and couldn't resist. I made a quick fig and raspberry jam inspired by Julia Child's book Baking with Julia, in which you can find a fig raspberry crostata to die for. Fig trees produce figs twice a year, once right when they put out new leaves, which results in a very small fruit crop, and later in the summer for a more bountiful fall crop. I love the combination of the two fruits so I decided to use that under the frangipane. I didn't strain the seeds out since they add texture and I don't really mind them. I only added a teaspoon of jam at the bottom of each frozen tart, and piped the frangipane on top. To finish the dessert I made the always pleasing lemon-verbena ice cream. Lemon verbena goes so well with more stone fruit and berries, so I figured it would work with the flavors of this tart as well. Cut the figs in small pieces and add to a pan with the rest of the ingredients. 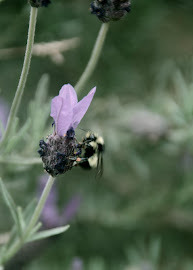 Bring to a soft boil and cook until thick, stirring occasionally. Cool completely before adding it to the tart shells. Bring the cream, the milk and sugar to a boil and steep the lemon verbena for an hour. Re-heat the cream mixture to a boil, and slowly pour onto the yolks whisking to temper them until they thicken into a custard. Add the salt and strain the yolk custard into a bowl set onto an ice bath. Chill completely and then freeze the ice cream base in your ice cream maker according to the manufacturer's instructions. The resulting tarts were very good, the jam was delicious and the ice cream worked well with the rest of the flavors. The frangipane was a little on the dry side, having to do with the reduction of the sugar amount. It was still plenty sweet so I am glad I cut the sugar. Thanks Jasmine and Annemarie for choosing this recipe and teaching me a new tart I didn't know. Yum!! Your tart looks wonderful =D. Awesome job on this challenge! OOH WOW, fig and raspberry jam sounds so decadent. 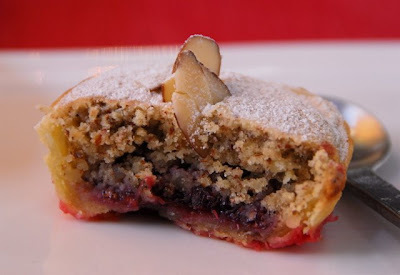 I like to make a date-raspberry crostata... or fig - raspberry crostata on occasion, so I can only imagine how great it tastes with the frangipane! Everything came out wonderful - great job! Beautiful tart! Fig and raspberry jam sound like a perfect match. Great job! Smart choice with the fig! I'm monitoring the growth of those on my in-laws' tree. 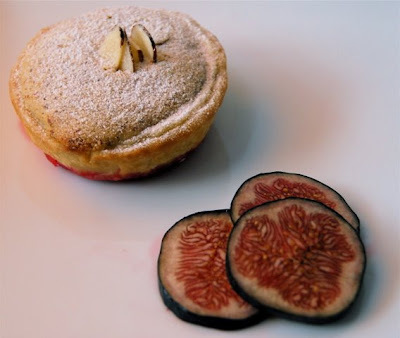 I still consider figs as autumn fruit, so I like the combination with raspberries, that talk totally summer! Beautiful job!! Love the fig and raspberry jam, yum. the jam, the ice cream and the tart looks & sounds AMAZING. Well done. Lovely tart--I do like your fruit filling combination. I'm reading through as many posts as I can and it's funny how people thought the frangipane was either too sweet or not sweet enough! 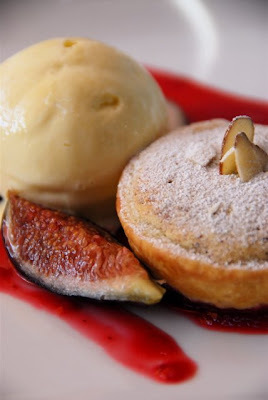 Fig and raspberry sounds wonderful with ice cream! Lovely pictures! I loved your fig and raspberry jam tarts! I'm going to have to try that recipe! It was good to see you last week--you picked a great place for dinner.